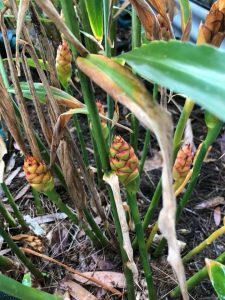 Over the years of trying to grow my own food, I have discovered that the only things that don’t get eaten by the possums, grasshoppers, caterpillars & native rats (which chewed through the nets I’d put up to try & stop the grasshoppers & caterpillars) are turmeric, lemongrass & ginger. Even the chili bush was stripped of every chili & leaf by the possums last year. Oh, and I have a very happy bay tree growing in a pot. I’ve even supplied my organic bay leaves to a local restaurant for free. Fortunately, The Hubby & I love ginger & turmeric & have some every day, so having all the garden beds planted out with these two, and one very enthusiastic lemongrass bush, is a win-win. I’m starting to harvest the latest bumper crop little by little according to our needs. What a joy it is after all those years of failure & frustration. It’s a life lesson really, isn’t it? For years I battled to do what I thought I should do no matter how stressful it was and no matter how much it cost me emotionally, physically and financially. Mind you, as far as growing my own food is concerned I was also passionate about it and really, really wanted to be able to make it work. But no matter how hard I tried and how much money I threw at it, nature always won. All I ended up doing was feeding the neighbourhood possums, bugs and native rats. There was nothing ever left for our table. So now I’ve let go of that dream and support my local organic store and farmers markets instead. In so doing I’ve discovered the delights of growing the things that really thrive in my garden, things that even those voracious native rats leave in peace. 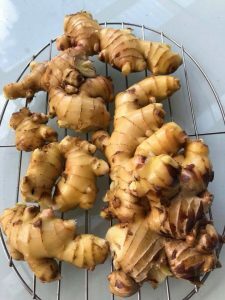 So here’s to a bumper harvest of ginger and turmeric. And here’s to celebrating the delicious things we will make together and the health they will bring – physically and emotionally.